Nothing feels quite right. Nothing is quite where it belongs anymore. Everything moved . . . or maybe you moved. Either way, you feel disoriented. At sixes and sevens. Bewildered. Baffled. Caught between what-was and what-will-be. Walking away from something, perhaps, but not quite sure where you’re even headed. It’s about loss and how we cope with change. It’s about Jesus and why I love Him and follow Him. It’s about church and church people and why both make me crazy but why I can’t seem to quit either. It’s about embracing a faith, which evolves, and the stuff I used to think about God but I don’t think anymore, and it’s about the new things I think and believe that turned out to be old. It’s about the evolution of a soul and the ways I’ve failed; it’s about letting go of the fear and walking out into the unknown. I’ve heard that most of our theology is formed by autobiography. This is true in my case and maybe it’s true for you too. Come at it sideways, let me hear the truth, but let the truth find me too. We’re all still being slowly dazzled. I am still wrestling with some aspects of my Mother Church. Perhaps you are too. Resting in the in-betweens is okay for now. You may find, like me, that you are reclaiming more and more, fighting your way through the weeds of over-realization or extreme cases or weirdness or wounding, to find the seed of the real that is still there. After the fury, after the rebellion, after the wrestling, after the weighing and the sifting and the casting off and putting on, after the contemplation and the wilderness—after the sorting—comes the end of the striving and then comes rest. Perhaps we are never really free from the ones who came before us; we simply make our peace with the ways they haunt us still. A while ago, a new friend, Nadia, drove me to the airport in Denver after a conference. We spoke of the power of resurrection in our lives, how the very things that used to hurt us were instruments of our healing. We talked about all the ways that our lives had been changed, how our eyes had been opened, how our worlds had been made new because of this man from Nazareth. Nadia was referencing the work of French philosopher Paul Ricoeur. Ricoeur thought we began our lives in the first naiveté: basically, we take everything we are taught at face value. Some of us never move out of this stage in our spiritual formation and growth. We simply stay faithful to what we were taught at the beginning. But most of us, at some point, will encounter the second stage, which he called “critical distance.” This is the time in our formation when we begin to . . . well, doubt. We begin to question. We hold our faith up to the light and see only the holes and inconsistencies. In a modern world, few of us can escape a logical look at our faith without some serious intellectual dishonesty. A lot of what our ancient-future religion teaches doesn’t hold up to modern logic. Many of us simply stay in this rational stage, and sadly, when we become rational, some magic and beauty is lost to us. Yet he writes, “Beyond the desert of criticism, we wish to be called again.”3 I remember crying out to God once while in the midst of what I called my wilderness, what Ricoeur calls the critical distance, because I was longing to “go back.” It was somehow easier when life and faith and God were an exercise in rule making and literalism, in black-and-white cause and effect. I found it was not enough to live without the magic and the beauty, without the wonder. I couldn’t return to my first naiveté and I missed the simplicity of it. I wanted to be called again, to hear the voice of God again, perhaps never more wildly than when it felt like the God I once knew was disappearing like steam on a mirror. In my own journey, I witness this trajectory: the first naiveté of my faith, then the bitter struggle and relief in the critical distance, and now, a second, sweet naiveté. The second naiveté is life after the death of what was once so alive, after the sorting through what remains, after the rummage sale perhaps. We have an inheritance that we have carefully curated. No wonder Nadia and I were crying in the car. We had sorted through our faith. We were still tossing what needed to be thrown out and reclaiming what needed to be treasured. We had found beauty and pain were threaded together. We were choosing this life, this Jesus, over and over again. I’ve come to believe that there is always a bit of grief to the sorting out of a life, to making sense of the stories and the moments and intersections, in our ability to move forward with integrity. We figure out what we need to keep, what we need to throw away, and what we need to repurpose. Sometimes what looks like junk becomes precious because of the memories it holds. Other times, the memories are painful, and so we hold them to remind ourselves: never again. But as we make small piles of treasures and trash, we are sorting through a life and through our grief, making the way clear to move forward. This happens when someone we love dies, you know. We remember the person’s life and we sort through our grief, our memories, our experiences, so we can find a way to move forward. For instance, I clearly remember sitting in my maternal granny’s hospital room while she was dying. I was curled up in one of those plastic-covered hospital chairs in the corner, five months pregnant with my eldest daughter. We granddaughters took turns in that room, ostensibly there to offer our mothers a respite. In reality, while the respite was offered, they never took us up on it: they never left her side. One afternoon, I sat in that chair with a Styrofoam cup of tepid Red Rose tea in my hand. Red Rose is the tea of hospitals, funerals, and church basements. My mother sat on one side of her mother’s bed; her older sister sat on the other. They never moved as the last hours stretched out. They simply sat in her presence, holding her hands while she slept within the morphine, ticking the clock toward death. I watched them minister to her and to each other in silence. They would catch eyes sometimes, and I knew an entire conversation was happening between them across that bed. The sisters were waiting, but they were waiting in peace. Later that day, my granny’s husband of ten years, her late-in-life love, crawled into her bed with her. Owen curled around her while she slept away from us, and he held her close till nearly her last breath. She died, and we all felt the peace of it. After she died, her children gathered in her apartment. Owen gave them the gift of space to sort things out and to remember. My granny didn’t have much worldly treasure: she lived on an old-age pension in a tiny apartment in Edmonton. Humble or not, that final sort-through after death is a place of reckoning and it’s an altar. They stayed up through the night, reconnecting with their mother by telling the stories of her things, choosing items for themselves and assigning gifts to the grandchildren. My mother came home with a box of Granny’s things, but she couldn’t bring herself to really sort through it for quite a while. The grief was still too new. That box sat in the basement. When she was ready to sort through, it was there waiting. In the meantime, she began to learn how to live without her mother. A year after the funeral, we met up at my auntie’s house for Easter weekend. We looked at old pictures. We told the stories to each other so we would remember; we each had such different experiences of her, we needed to share our narratives to gather the full complexity of her life. We even talked about her things and what we had done with them, how they traveled with us through our lives and where they lived in our homes. Later that night, when everyone else had gone home, I tucked my then six-month-old daughter into her fold-and-go bassinet in the guest room. I stayed up too late, sitting on the couch beside my mother and her sister with a recently discovered box of old letters, receipts, and scraps of photos. They went through them, sometimes laughing, sometimes crying, sometimes angry or sad. They passed the bits of paper and photographs to me: Hold this one, they said. And this one. Remember this? Oh, let me tell you about this one! It was their instinct to fill in the blanks for me, to help me see the truth of their mother, to love her better because of how they had loved her. I didn’t say much that night; sometimes our most holy calling is to listen, to bear witness. I held the scraps and the stories of what remained from the sort, my legacy. But we weren’t given the gift of sorting when my dad’s mother passed away. My grandma Nellie wasn’t a typical grandmotherly type: she was tall and strong, hardworking and opinionated, ferocious and kind. She felt things deeply, yet she experienced grief and devastating loss with the prairie stoicism of the time. She loved hockey and gardening and western novels; she’d rather be outdoors than in any lovely room. We wrote letters throughout my life; I have them all saved in a shoebox still. It’s probably silly to dare imagine that I understood her at all, but I tried. And she loved me well. When I was young, I worshipped her. Even later when the spell broke, I always felt at home in her stern love. One day, when I was about seven years old, I was riding with Nellie and my grandpa Ken in his old red-and-white Chevy truck on our way to our shared family cottage. We were out of range of the radio, and the windows were rolled down because it was a stifling day. Even the wind was hot in my hair. I was feeling sleepy, content as only a secure child can feel. I leaned my head against her warm arm, so my ear was pressed right against her bare skin, and she was humming wordless melodies. The reverberations in her skin wound down into my own body. I remember wishing I could stay there, in that spare truck cab, smelling of my grandpa’s cigarettes and her perfume and my suntan lotion, forever. This is also how we absorb our legacies, slowly over time, through presence and osmosis. My father is estranged from one of his brothers, and despite his efforts at reconciliation, the great sorrow remains part of our story. Even when their mother was dying, they were unreconciled. My father remains deeply grieved at their broken relationship, but he respects it. At some point, we all have to let people live their lives, even if that means they want to live them far away from us. And it was quite clear that my uncle, believing in the truth of his reasons, had no wish to live his life in any sort of contact or familial friendship with any of us. History repeats itself. This broken bond of brothers happened, yes, but I could argue that it was always going to happen, that it was our legacy. My father’s own uncles—Nellie’s brothers—lived and died in decades of silence. They grew old on the same family farm and willfully became enemies, then remained strangers in their pride. They died unreconciled. So when estrangement reemerged in my father’s generation, we all knew that—barring a miracle—there would be no happy ending. There would be no forgiveness. Once the grudge begins, it never ends. Maybe we’re all just corkscrewing around the same stories over the years. Things like this are bearable in a regular day-to-day life, but they become unbearable when shadows fall. So even though the family was splintered, it was mostly okay, bearable, for all of us as we got on with our separate lives, right up until Nellie began to die in good earnest. I still firmly believe Nellie died because she simply made up her mind to do so. She was ready for death, and so death came at her bidding. Her end-of-life care instructions were clear, without sentimentality. If it was time to die, then for mercy’s sake, let’s get on with it. Nellie grew up on the prairies of Canada. Life wasn’t easy, but she belonged there. Not all women do, we knew that well, but she did—she was a survivor. She was born in the Roaring Twenties but her story was not a scene out of The Great Gatsby. There in the land of the living skies, the Twenties roared with work. Tiny farmhouse, a father who battled with alcoholism, Canadian winters—so much labor required to simply survive. Her family made their own bread, churned their own butter, milked the cows, raised a vegetable garden, and “did down” the vegetables and fruits (which is what we call canning and preserving), so they’d have food when the winter came. She attended a one-room schoolhouse until grade eight and then had to take correspondence courses for grades nine and ten. She loved to learn and longed to be a teacher but it was not to be. She told me once that she cried every night for weeks over the death of that dream. Nellie wasn’t beautiful for any era: her bones were too sharp, her height too commanding, her face too long, her straightforward gaze too intimidating. But she was self-possessed, taking the loneliness of her landscape into her heart, content to stand. They said she rode horses like a man. She would put on her slacks and race with the boys, defying everyone just to feel the wind on her face. When she moved to the city with her new husband after the war, she missed the farm. If she had been a boy, she might never have left her homestead. But instead, she found herself married to a local boy whose greatest charm was a gift for gab. She raised their three boys and buried a stillborn daughter, making a home in the postwar bungalows of Regina and faithfully working the complaints desk at Simpson Sears department store. But her longing for freedom was always there: when you grow up under the stars of the prairie and the wild winds, it’s hard to submit to the city, I imagine. To me, Nellie embodied the prairie we loved. At times, hard and indomitable, but at others, caressing, beautiful, and tender. I worshipped her when I was a child, yes, but I grew to love her all the more for her complexities, her vastness, her sweeping presence, her edges. She was never simple or trite; I am unable to sum her up by the usual grandmotherly platitudes. When she died, some little-girl part of me couldn’t believe it. How could such a strong woman, so resolutely alive, be dead? She died. And the family did not gather for the sort. We didn’t get to go to her house and tell stories about our favorite photos or treasures, swapping memories to help us say good-bye. We simply waited in a hotel room while my uncle took care of all the details. Our grief had no release of storytelling and memory keeping. No books and costume jewelry and dusty boxes of black-and-white photos to mull over. We needed to laugh so we could welcome the tears. We needed to sort through her life, together, and we needed to take care of the details together. Instead, we went to the funeral home for her wake on the night before her burial. We stood in the heavy room, drinking Red Rose tea, awkward and silent strangers to one another. How do you hug someone, offer comfort to someone who won’t speak to you? I had asked my dad to request a box since we weren’t going to her house to sort her things out together. After the funeral, my uncle presented me with a cardboard box from her house containing a few scrapbooks of her newspaper clippings, a couple of letters I had written to her, random knickknacks. It was a casual smattering, but it was beautiful to me. At least it was something. I do have a few of Nellie’s things, and I’m forever thankful for those treasures. In the years before her death, every time I visited—which wasn’t often, since I lived far away—she would fill my suitcase with her chipped teacups and saucers, dusty cardboard hardback westerns by Zane Grey, a few pieces of costume jewelry, and other tchotchkes. In my dining room cabinet, I have her decorative plate imprinted with gold-leafed wheat stalks and the prayer “Give us this day our daily bread”; it used to sit in her dining room cabinet. I have her tiny orange ceramic cat, tail curled around its slender body. It used to sit on her kitchen windowsill, presiding over the grandkids washing dishes. Later, I heard that my estranged uncle held an estate sale to dispose of her things. I didn’t go to the sale because I wasn’t invited or informed until it was over. Whatever she had given me before her death was all I had now. Every once in a while, nearly ten years later, I remember something of hers and I wonder what happened to it. What happened to the mirror that hung in the entryway? What happened to the midcentury bread box? The candy dishes that sat on the coffee table? The little ceramic animals hiding among the leaves in her African violets from the front room? Where are her things? It’s hard to move forward when you feel like you never properly said good-bye or resolved your memories. Someone else bought most of her things, and whatever was left went to the Salvation Army to sit on metal shelves under fluorescent lights, examined by the uninterested. I wonder now if the experience of sitting together, telling the stories as we sorted through her home, if that would have healed us? If we needed to learn to love each other better by all loving the same old woman? We sort on the threshold of change; it’s how we gather the courage to eventually walk through the door and out into the new day’s light. Of course there is grief in this process, whether it’s from the death of a loved one or the death of an old way of life. Of course there is. Whether it’s in our relationship with God or with our own families, at some point we find that it is time to sort. It’s time to figure out what we need to keep, what we need to toss, and what we need to reclaim. And we need to tell our stories in order to move forward. First there was the establishment of the Church. Then in the sixth century, we experienced the fall of the Roman Empire, or the dawn of the Dark Ages in Christianity (it can be said that this was the bright season of other religions, such as Islam, which enjoyed great growth in theology, science, literature, and art during our Dark Ages). Then roughly five hundred years later, we experienced the Great Schism, when the ancient Church split into the East and West. After another five hundred years, we experienced the Great Reformation. Now we are creeping resolutely toward another “great” disruption. It’s simply part of our life cycle as Christians. The old remains in some form or another, but the new expression will launch the Church into a new world. Tickle explains that every time the incrustations of an overly established Christianity have been broken open, the faith has spread—and been spread—dramatically into new geographic and demographic areas, thereby increasing exponentially the range and depth of Christianity’s reach as a result of its time of unease and distress. Thus, for example, the birth of Protestantism not only established a new, powerful way of being Christian, but it also forced Roman Catholicism to change its own structures and praxis. As a result of both those developments, Christianity was spread over far more of the earth’s territories than it ever had been in the past. So right now, we are all cleaning out our homes. We are in a time, much like the Great Schism and the Great Reformation, of sorting through our religion as a universal Church. It’s a fascinating study to look at how we’ve landed here: technology, philosophy, science, medicine, art, sexuality, politics, ethics, faith, media, development, globalization. The Church is being reinvented in response. We are dying, perhaps, but even death is part of our story: it comes right before resurrection. It’s already happening globally—on the margins and among the disenfranchised, in the outsiders and the grass roots. I’m sure the great bastions of power and leadership within the Church are feeling the strain of the shift. This got me to thinking: If the Church is in the midst of a rummage sale, aren’t we all in the midst of a rummage sale? We sort through our mess on the threshold of change, don’t we? When we are moving. When there has been a death. When someone leaves. When we need the space. When we are changing in some way. Even if we’re glad to be getting rid of things, there is still an emotional attachment to our stuff that plays out as we figure out what needs to stay and what needs to go. After their parents died, my own parents decided to get their house in order. Rather than leaving us with a houseful of receipts and boxes of unidentified people in photos and scraps of bank statements to follow like a trail of breadcrumbs, they embarked on a several-year project of cleaning, purging, and organizing their home and their finances, even their decisions about death. They did not want to saddle my sister and me with the decisions about their end-of-life care or unorganized finances or junk accumulated over a lifetime. As an act of love, they wanted even their death to be as easy on us as possible. I think about Nellie’s things now and again. The grief of being denied the opportunity to go through her earthly treasures with the eye of love and the tenderness of memory still stings. In fact, I hate it. I hate that strangers picked through her things, I hate the thought of her special, scrimped-for knickknacks marked with price tags, I hate that the little things she loved have disappeared. Mostly, I hate that the estrangement continues in silence. At the threshold of any change, we are confronted with fear. This is a pretty natural response to the birth of new life. In childbirth, Dr. William Sears calls it the “fear-tension-pain cycle.”6 When a woman is in labor and first feeling pain, she often becomes afraid and then she naturally holds back or tenses up, but that response only causes more pain, and so she experiences even more fear, which leads to more pain and so on. It’s a terrible cycle that can impede or slow down birth. To interrupt the cycle, midwives and doctors recommend that women surrender to what is happening in their bodies. Counter to our intuition, the solution is to lean into the pain. As I write this, my fourth little baby is sleeping in her crib, only three months old. Well, actually she is my eighth baby. I’ve lost four babies before birth. So this isn’t exactly dry philosophy to me: I understand new birth and creation as more than a metaphor. As I have given birth to my babies, I learned the truth of Dr. Sears’s words for myself: the fear made the pain worse. It was only by releasing the tension, by embracing my fear and my pain, that I was able to lean into the work of my body and be delivered. I have had to lean into the pain and grief of my faith as well. Often, when we are on the threshold of new life or new birth, there is first the labor and the work. We become afraid of the pain we feel, and so we tense up and hold back—but that only increases the pain. These days, it’s the fear of “what if?” and of loss that rises up in me. Whether it is the pain of community or of how we understand the Church or of how we have lost Jesus or of what we think about hell or signs and wonders or suffering, the fear to engage with our evolution only worsens the pain. As for a caterpillar in the cocoon, it becomes more painful to stay within our tight home than to simply break free and unfold our new wings. We fight the very thing that is meant to free us. It is only by releasing ourselves, giving ourselves fully over to the pain, and riding its cleansing wave that we find new life. So this is a book about how feeling out of sorts leads us to sorting it out. About our personal rummage sales, how we engage with our first naiveté about so many areas of spirituality, and how we find the critical distance and the doubts. And then, how we experience a second birth. I’m under no illusions that I’m finished—and I don’t imagine you’re finished either. I tend to think that we are never fully done with these stages. Someday we’ll look back on these opinions or landing points and know that this was simply an embarking point of another kind. But this is the process; this is how it begins. As we walk through this sort together, I’ll also tell you about my own rummage sale, the grief that came with the sorting, and the healing that was ushered in. What I had to weigh and discard and evaluate will be different than what you will have in your own house: we all have our own legacies and baggage, family heirlooms and hoarders. One thing this book is not about is convincing you to end up in the exact same place or opinions as me. How could that even happen, when we start from different places? As Paul wrote in Romans 12:2 (NLT), “Let God transform you into a new person by changing the way you think. Then you will learn to know God’s will for you, which is good and pleasing and perfect.” Yes, we are being transformed by the renewing of our minds, transformed in response to the weight and shaping of Christ in us. There are many of us out here sorting, I think. This might be a small candle, but I’ll set mine on the lamp stand and you can set yours there too—and maybe our glow will light the path for others. "Honest, sober, and encouragingly relatable." 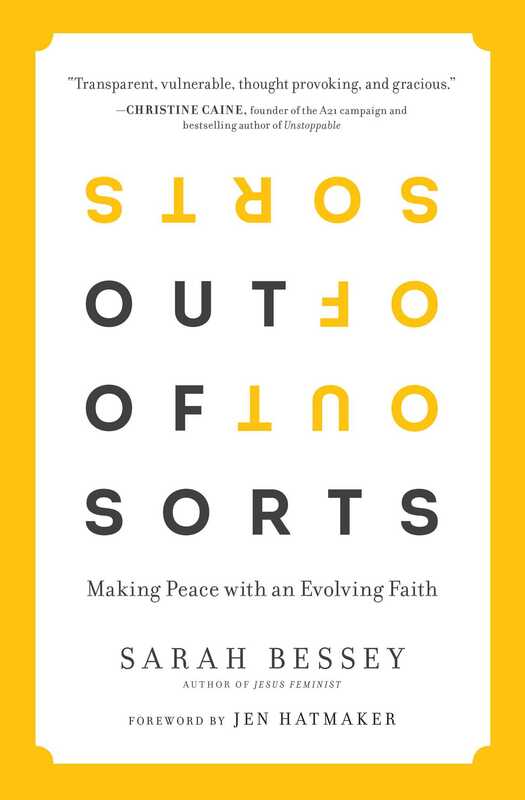 “Out of Sorts reads like a love letter to Jesus and to all those desperate to see His true face. Through her indomitable heart, brilliant mind, and vivid writing, Bessey sets an extravagant, cozy table in the middle of the spiritual desert." 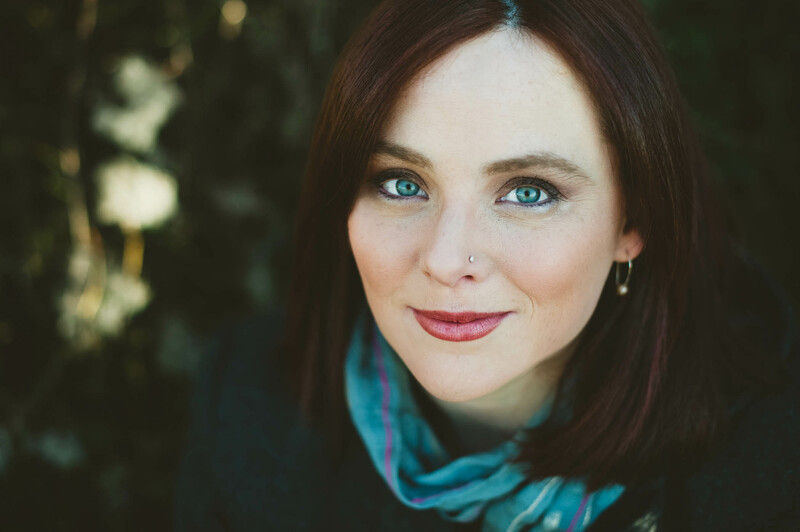 “With refreshing honesty and engaging passion, Sarah Bessey reminds us that cheap certitude is a poor substitute for genuine faith." "[Bessey] creates a loving, inviting environment from which readers can approach their own questions, beliefs, and maturity." "Bessey offers a good forum for Evangelical Christians to question what they believe without getting bent out of joint."